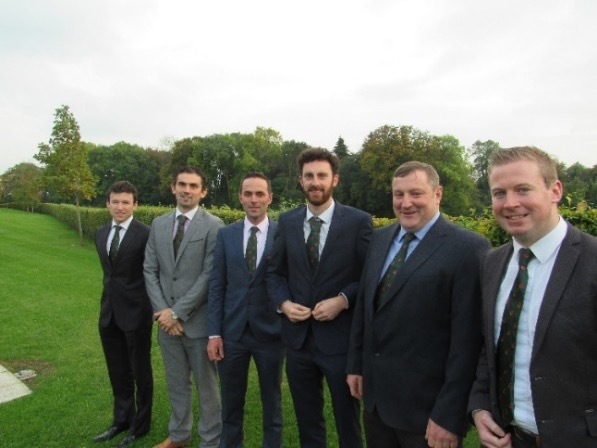 Photo caption: 2017 Nuffield Ireland Scholars: Left to Right: Niall O’Regan, Ed Payne, Eamon Sheehan, Bryan Hynes, Owen Brodie and Lorcan Allen. In September, we selected the six 2017 Scholars from almost 40 applications. Briefings will be arranged in January for the new Scholars with agri-food businesses, policymakers and sponsors, to provide insight into the Irish agri and food sector. Ireland hosted the Contemporary Scholars Conference in Cavan in March. There was an attendance of almost 100 Scholars, country chairs, executives and guests from 12 countries. 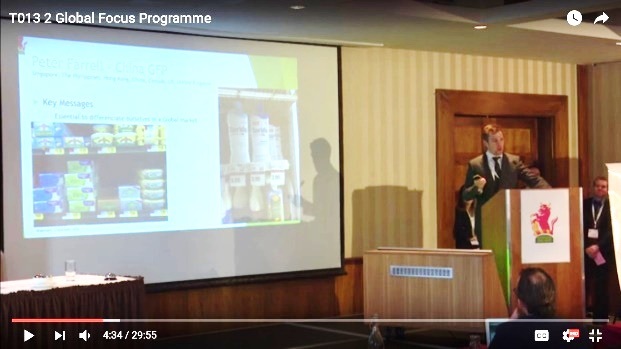 The Scholars had the opportunity to meet speakers from companies, policy makers and technical experts, and to visit companies and see the Irish grass-based dairy system. They also experienced local food, culture and sport (Gaelic Football local derby between Cavan and Armagh). There is no truth in the rumor that the Guinness ran dry at the Cavan Crystal Hotel during the week of the CSC! Our Annual Conference took place in Dublin on 14 October. There were 135 delegates, with almost two-thirds of our alumni in attendance. We had presentations from the returning 2015 Scholars, and the 2016 Scholars presented their GFP experiences, key messages and main issues that they learned. Our Keynote speaker, Michael Hoey, is MD of a very progressive family-owned, agri-food business, which is one of the largest growers and suppliers of potatoes and onions to retailers in Ireland, and has a prepared foods division. Jim Geltch attended and addressed the conference, which was followed by a dinner where 100 delegates and guests attended. Britain’s decision to leave the EU has major consequences for Ireland. Over 40 per cent of Ireland’s food exports are to the UK, with uncertainty about how this will be affected. The fall in the British Pound since the referendum has severely hit the value of these exports. At times the decline in sterling was 15 per cent against the Euro. We have a 500km land border with Northern Ireland, and it remains to be seen how this will be handled post-Brexit. There is very little clarity about the likely consequences or timescale of Brexit, so, this topic is very high on the agenda. Business does not like uncertainty, and many companies are already taking decisions to reduce the risks. Mary Delaney (2014 Sch) was elected as President of the Agricultural Science Association (ASA). The ASA is the professional body for graduates (Level 8 degree) in agricultural, horticultural, forestry, environmental and food science, which has 1,700 members. Kevin Moran (2015 Sch) received the 2016 FBD Young Farmer of the Year award. Brian Rushe (2015 Sch) was elected County Chairman of Kildare Irish Farmers Association. Aisling Meehan (2011 Sch) is on the Council of the Law Society of Ireland. John Fagan (2002 Sch) was the feature farm on RTE’s (Irish national TV) ‘Big Week on the Farm’, which was transmitted on five successive nights in April. From lambing, calving and hatching, Big Week on the Farm charted the life-cycle of farm animals, providing the nation with real-time access to the world of Ireland’s farming countryside. This series explored how a new era of farming is emerging, with technology and science innovations, like precision farming and beef genomics transforming the industry. ‘Big Week on the Farm’ was the overall winner of the Agricultural Journalism Awards for 2016. Shane Fitzgerald (2011 Sch) held an open day on his farm to mark his success in winning the National Heifer Rearing Competition. Shane was also elected on the Council of Glanbia Co-op in 2016, and joins Padraig Walshe (1996 Sch) and Jonathan Tighe (2008 Sch) on the Glanbia Co-op Council.